We were tasked with developing an eLearning course that would allow customer service center staff to practice conversations with the customers who are not satisfied with the quality of the products received. If you’ve ever taken a conversation-based eLearning course before, you were probably given a limited choice of questions and responses that you, as a learner, could use to interact with your virtual customer. Your course itself probably consisted of several branching funnels that sent the learner down the selected path based on the statements selected. While the eLearning industry has gotten away with producing these types of eLearning solutions in the past, it’s no secret that this kind of interaction is very limiting because all statements and responses are pre-programmed and pre-written. In addition, this type of training can never offer enough of a challenge to make the training engaging. Let’s face it, all learners love a good challenge. On this particular project, we needed to make the training experience resemble real life situation as close as possible. This meant that we could not rely on limited pre-written statements, and instead had to find a way to score any statement a learner would make. From the start, it was clear that the traditional approach of providing the user with a limited choice of responses and building a typical branching course would not work here. After studying all options, we determined that the best solution to this problem would be to utilize artificial intelligence to process the text entries. Using ClueLabs AI Engine for eLearning, we built a fully automated chat service that enabled us to receive the text entries from the learner, process and score those entries, and respond appropriately. Another requirement for this project was to design a service that can keep track of the conversation flow, match the conversation against the template, and determine whether the learner is making the right comments at the right points in the conversations. 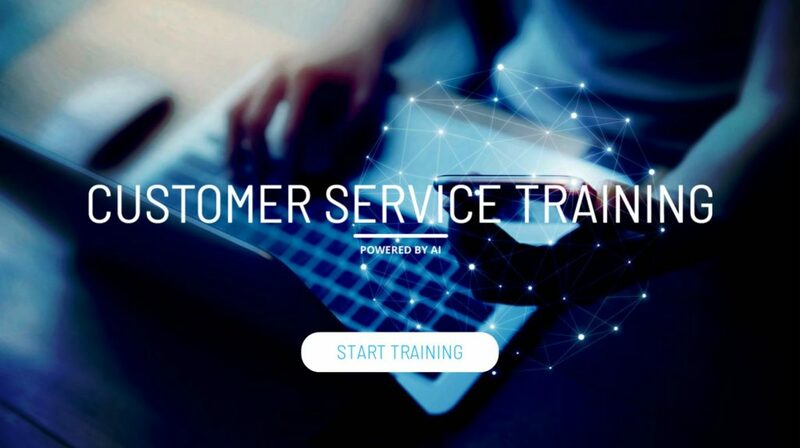 In addition to training the AI engine to recognize the statements from the learner, we ensured that it is also able to check whether the learner follows the customer service steps required by the company policy. Finally, as the client starts using the AI-powered eLearning module, the AI eLearning engine will be able to learn from the users’ input and improve text recognition as it goes. This will ensure that the service doesn’t get outdated even if the corporate language changes in the future, which will allow the company to use this learning module for many years going forward without having to update the eLearning module. Do not hesitate to contact eLearning Company If your organization would like to explore adding advanced features such as AI, data analytics, natural speech processing, data insights, etc. in your eLearning products.